Nassau members have the opportunity to participate in competitive travel tennis teams that play against other clubs in the area. Nassau has teams for a variety of levels of play. 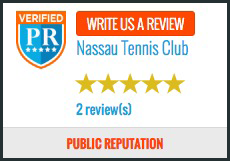 Nassau is a member of the Central Jersey Women’s League, USTA Middles States and USTA Eastern New Jersey. For more information on our travel tennis teams, click on the links below. To learn more about our travel teams, please call 908-359-8730 and ask for Stacey. Nassau Tennis Club is proud to participate in the Eastern & Middle States Division’s’ Women’s USTA Indoor Travel League. Teams begin to form as early as Spring for the upcoming Fall. In addition, Nassau offers Spring USTA teams and USTA mixed doubles teams in the winter that begin to form in October. Both home and away, team players compete from September through April. The club fields 3.0 teams on Tuesdays and 3.5 teams on Thursdays in the Eastern division. New in 2013 – 3.0 USTA Middle States team that will play on Thursdays. To learn more about our USTA travel teams, please call 908-359-8730 and ask for Stacey. Nassau participates in the USTA Middle States & Eastern New Jersey Spring leagues. Women’s USTA teams range from 2.5-4.5 levels. Teams begin to form as early as December for the upcoming Spring. In addition, Nassau offers USTA mixed doubles teams in the winter that begin to form in late September. Team schedules will vary by club location. Below is an approximation of when Nassau USTA teams play. Nassau participates in the USTA North Jersey Spring leagues. Mixed Doubles USTA teams range from 6.0-10.0 levels. USTA mixed doubles teams play in the winter and begin to form in late September. Mixed doubles teams play home matches on either Saturday evenings or late afternoon on Sunday. Most away matches will be played on Saturdays later afternoon or evening. If you are interested in playing on a USTA mixed doubles team, please email your name, level and phone number to teams@nassautennis.net. For more information on our teams, call 908-359-8730.